" We worked with Allison Grace and she was very knowledgeable and such a joy to work with. 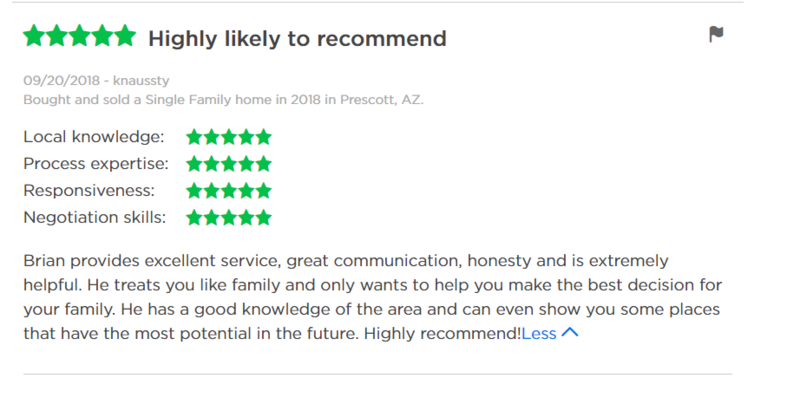 Some of are relatives are thinking of moving to Prescott and we will recommend Allison. We feel that Allison went out of her way to be sure we were comfortable with the whole process of buying a home. " " When our family decided to move to WA due to my husbands job we had originally gone with another agent. After having our home on the market for 72 days and no offers we decided we needed a new agent. We called the Bergamini group and they were happy to help. Once we relisted our home with them, they had a professional photographer come to the house and take pictures. The new listing looked amazing and within 4 days we were under contract! We can't thank them enough for working hard and getting our house sold. " " DJ Sheridan is awesome! He drove us around numerous times (over a year and a half) showing us properties in Prescott, PV and Chino Valley. When properties came on the market and were within our price range and requirements, he brought them to our attention. He learned of a property that met our needs, so he toured the property and took a video so we could see all of it rather than just what was placed on MLS by the listing agent. We placed an off order on it based on DJ's video. Love our house and the effort DJ put forth on our behalf. I'll recommend DJ to anyone I can. He's the best in Prescott and the surrounding communities. " " If you're looking for a Prescott, Arizona real estate team, look no further than the Bergamini Group. They sold our house and found us our dream home by using the latest in marketing technology and their years of experience. We worked closely with DJ Sheridan on the team. He listened to exactly what we were hoping to find, and put the call out to all local realtors. His actions found us the perfect home! We are so grateful to him and his team. We would highly recommend them to anyone looking in the Prescott area. " " We used Executive Realty/Bergamini Group to help us find a retirement home/ lot that we could invest in now and live at in a few years. Randy was our agent and he was very helpful in understanding our desires, setting up home and lot tours for us, and helping understand the negotiation process. When we made an offer and ultimately purchasing a lot, Randy helped us all along the way to understand the various forms and general escrow process. We are very happy with our lot purchase and are looking forward to returning to Prescott to build our retirement home. Thanks, Randy and the Bergamini group! "